Breaking News!!! Kwame Baffoe Abronye "Resigns"
HomeLocal NewsBreaking News!!! 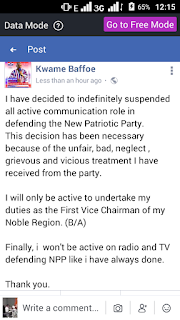 Kwame Baffoe Abronye "Resigns"
The First Regional Vice Chairman of the New Patriotic Party in the Brong Ahafo Region has taken a bold decision to suspend all his active communication role in defending the party. 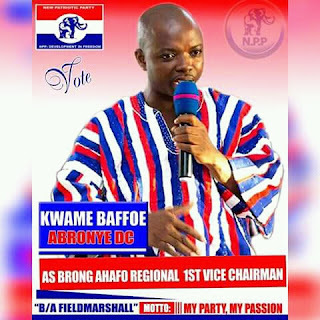 Mr Kwame Baffoe popularly known in the region as "Abronye" posted on his Facebook Wall today, August 7 2018 as monitored by fillascorner.com disclosing the reasons behind this step taken as unfair treatments he is receiving from the Party. He also stated that his own Party (NPP) in power has neglected, so he is suspending his extra role as a communicator for the party on Radio and Television. Abronye further stated that he will continue to serve the party only at the regional level at the First Chairman of the Party in the Brong Ahafo Region. 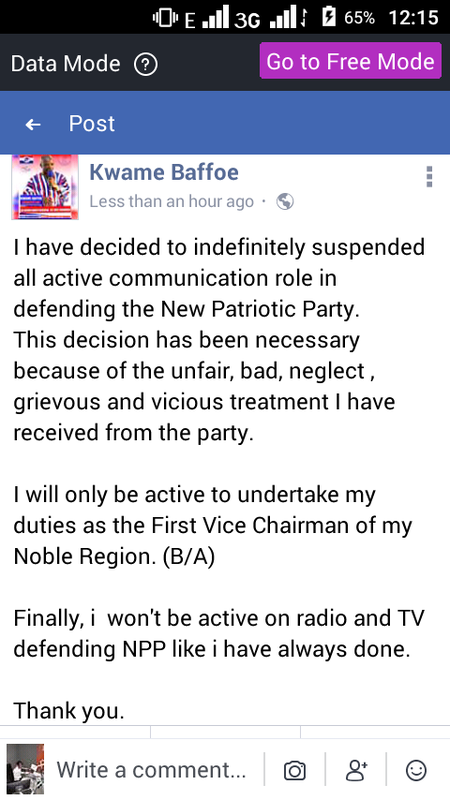 "I have decided to indefinitely suspended all active communication role in defending the New Patriotic Party. This decision has been necessary because of the unfair, bad, neglect , grievous and vicious treatment I have received from the party. Finally, i won't be active on radio and TV defending NPP like i have always done. There is a saying that 'One man no chop'so Abronya was angry because he was sideline by the NPP party. Abronya, take it easy that is why politics is a thirty game. Those who suffered do not benefit.